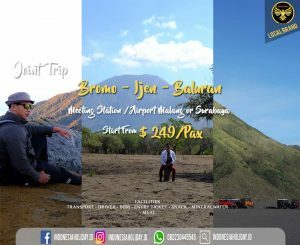 Joint Trip Bromo Ijen Baluran invites you to take a vacation to enjoy the beauty of Mount Bromo through the Probolinggo route. Bromo provides a very beautiful natural scenery blending with the golden sunrise in climbing love with the background of Mount Bromo, Mount Batok and Mount Semeru.  There you will be invited to explore the sand sea, bromo crater, temple ponten and teletabis hill savanna. Not stop from Mount Bromo, you will be transmitted to Mount Ijen with a blue fire that is very beautiful. A little tiring because you will climb for 2 hours to see the blue fire of Mount Ijen which is only 2 in the world. This open trip will end with a trip to Baluran National Park with natural scenery such as in the African savanna, of course, complete with all the habitat of wild animals in it. This joint trip makes it easy for you to visit these 3 tourist destinations without the hassle. We will depart at least 4 people. Note: Ittinerary / Rundown tour is conditional based on conditions in the field such as weather, disasters etc.